These are the acorns of our favorite eating (after processing!) oak, the Valley Oak, Quercus lobata. This is often what you see when you look at the ground under a Valley Oak this time of year. 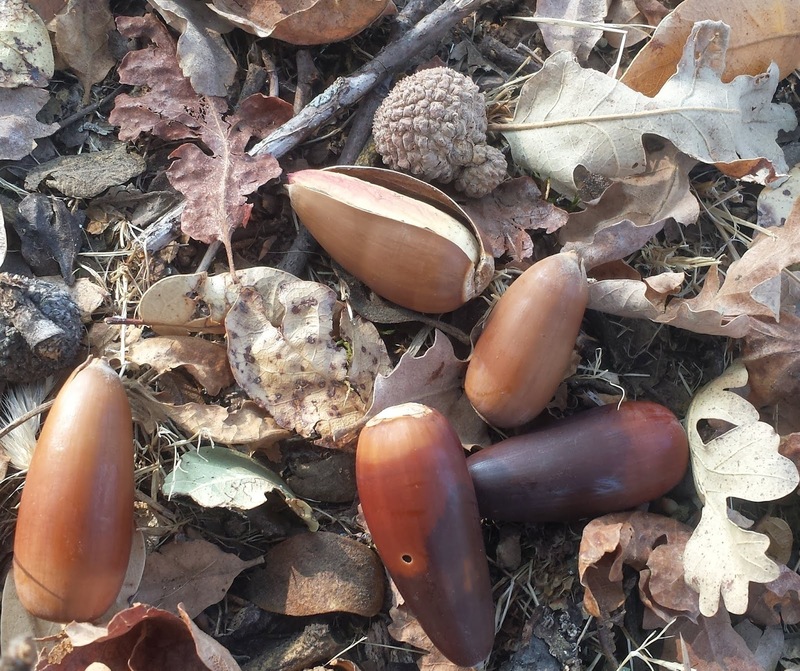 On rare occasions, you see something entirely different - not a total absence of acorns, which could simply indicate a poor crop yield, but a simultaneous abundance of acorn shells and absence or near-absence of intact acorns. If you find yourself walking under a Valley Oak on ground that doesn't look like shown above, rather resembling what is shown below, you may have found a Sweet Acorn Valley Oak. Thank the California Native Americans that were here before the Europeans. This is one of their domesticated crops. What? Lots and lots of acorn shells, and not a single intact acorn. There must be a reason ... and there is. These are sweet acorns (see last paragraph below), or at least their remains. "Fall" is the name of the season - sit under an Oak tree if you need a hint as to why it carries that name. In fact, more than a subtle clue to the origins of the name of the season, acorns are incredibly important food. They sustained First Nations populations across much of North America, as well as on many other continents. They still do in many places, and even reach mainstream culture in several modern countries, such as South Korea. We collect and eat acorns in our family, without any known Native American in our genetic heritage. The importance of Acorns can first be gleaned by noticing that the nut and tree from which the nut arises have different names: the acorn and the oak are on parity with each other as important objects to be able to identify. This is actually quite rare: either the fruit, flower, or tree gets named first and then everything else is named in reference to that first name. A peach is important, it comes from a peach tree. A cashew is important, it comes from a cashew tree. Pine nuts come from Pine trees, and are of "lesser" importance than the wood of that tree. Exceptions are rare: there is the 'ōhi'a tree of Hawai'i, and its flower the Lehua; the Oak tree and the Acorn; I challenge anyone to find more than a handful more examples. When you do, you have found something very important to our history. There are four types of Oak that are abundant in our general area: Tanbark Oak (actually in the genus Lithocarpus), Valley Oak, Blue Oak, and Canyon Oak. We only have the first and last in our yard, but the others are in the area and in the yards of family and friends. Valley Oaks are special in several ways: first, their acorns are large and leach easily, so these are fast to collect and quick to prepare. Second, they were domesticated by several tribes of the California Native Americans. With the arrival of Europeans and the wholesale displacement of these folks, many of these plots and forests of domesticated Valley Oaks were lost or forgotten. Many were cut down to clear land for other agriculture, ranching, or just firewood. The displaced people could not simply pick up the trees and relocate - first crops might take twenty years or more from seed planting, supposing the folks displacing the California Native Americans had been nice enough to let them wait to harvest the Fall crop before displacing them. Fortunately, these are long lived trees and many have survived, or given rise to additional generations of sweet acorns. What is a sweet acorn? 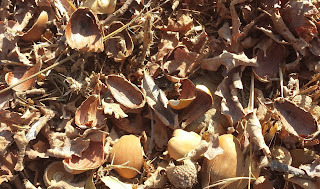 An acorn that does not have the massive amount of tannin that most acorns contain, one that can simply be dried and ground to meal before using. These are roughly comparable to chestnuts, some can even be eaten fresh (get local competent guidance). In our experience, we often give them a quick leaching treatment, as often these are not the original trees, rather their offspring that have been crossed with non-sweet trees, so they have greatly reduced tannin.